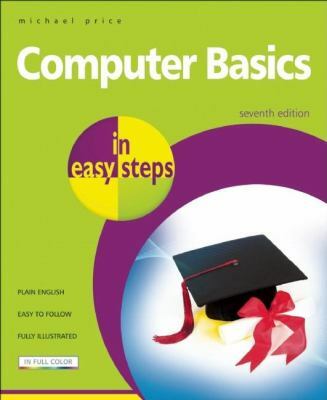 "Computer Basics in Easy Steps" offers both practical information and inspiration to digital newbies. In clear, simple language, Michael Price describes the hardware that makes up a computer, as well as popular programs and how they work. The book demystifies the Web, describing how to use it for hobbies -- from digital photography to drawing to genealogy -- as well as for downloading and sharing music and videos. Price also covers communicating with friends and family across the world, writing reports, and preparing papers and reviews. The book presents simple strategies for making the most of add-ons such as iPods, PDAs and pocket PCs, digital cameras, printers and scanners, and cell phones. Also here is expert advice on the kinds of tasks users typically want to perform, and on how to utilize the computer to increase productivity and enhance enjoyment and satisfaction. Used Very Good (3 available) Former Library book. Great condition for a used book! Minimal wear. 100% Money Back Guarantee. Your purchase also supports literacy charities.